Blonde Jamez Blonde, aka "Manny" is a very Handsome AQHA/PHBA Palomino yearling gelding. He is sired by Meet Me Downtown and out of Angie Schaefers good mare, Flash Me Toots ( Kid Clu x Flashy Zipper bred). Born, raised and shown as a weanling by Eagle Ridge Farm. Xceptionally Dunn, a RARE Champagne Grullo Colt, sired by 2X World Champion, World Champion Sire, Champagne Cadillac and out of the Multiple World Champion, World Champion producing mare, Ima Cool Kinda Lady. 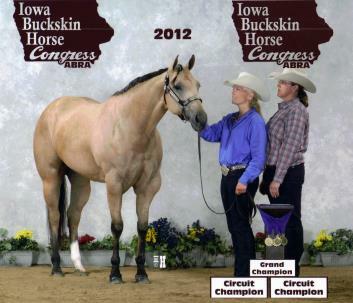 Consistently going AQHA GRAND Champion Stallion! December AQHA Journal, National Honor Roll list ~3rd in the Nation for both Open Division and Open Division Jr Halter stallions. 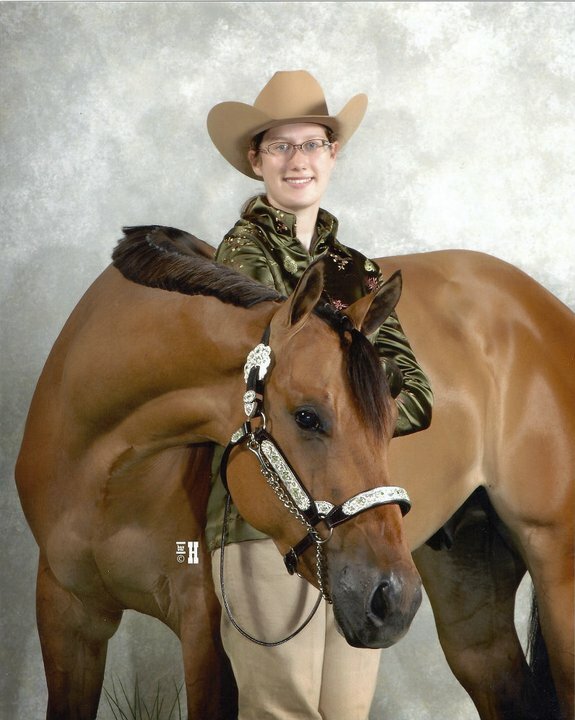 SUPER STYLIN, 2010 AQHA/ABRA/IBHA I.F. 16h Buckskin filly. She is sired by JMK Supernatural, 4X World Champion, Multiple Congress Champion and MULTIPLE World Champion Sire and out of Ima Bit of Style, our HUGE, 16h, bay daughter of Kids Classic Style ( Multiple World Champion, World Champion Sire and LEADING Sire). 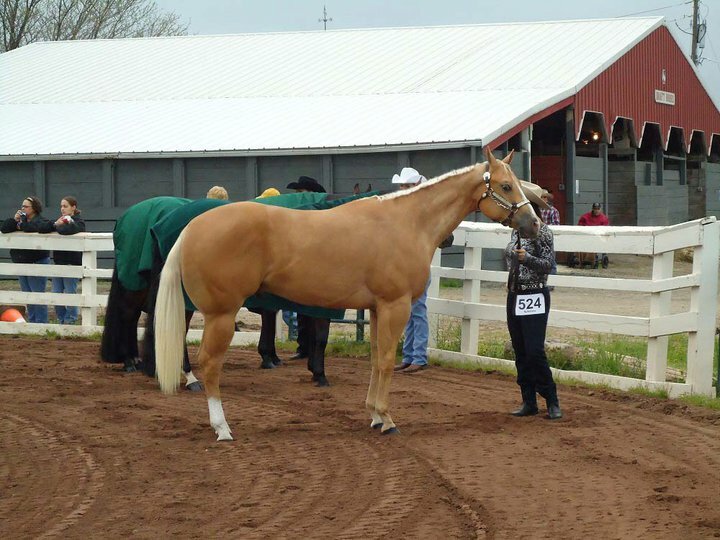 BH American Honey, is a 2010 AQHA Buckskin mare. She is sired by 16.1h Buckskin stallion, Kids Spanish Style ( Halter ROM) x Kids Classic Style ( Multiple World Champion, World Champion Sire and LEADING Sire) and is out of a producing daughter of Dandy Seeker (Superior Halter Horse w/ 58 Halter pts, 8 Performance pts, an AQHA Champion Sire, World Champion Sire and High Point Sire). ABRA World ~ 4th in Open and Amateur out of 14 Entries, including several 2nds under individual judges. 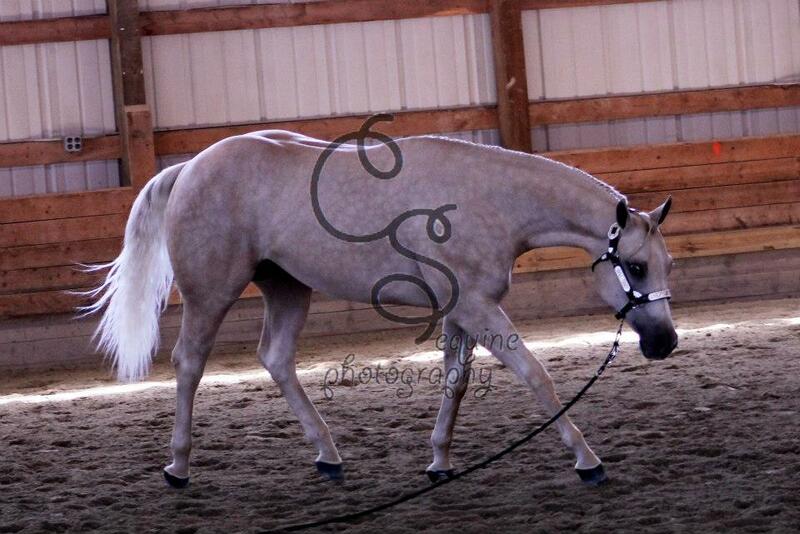 May I Hav This Dance, 2011 AQHA PALOMINO FILLY that is just dripping with muscle!!! Sired by The Midas Touch Kid and her Dam is Stan and Brenda Ammerman's GREAT mare, Imagine Me Dancing ( 72 AQHA Halter pts, Hi-Point Honor Roll) x Image of Kid. Showed AQHA, to 4 judges and got 3 FIRSTS in both Open and Amateur Yearling mares and then came back for 3 Reserve GRAND Championships in Open and Ammy as well!! "Whos that Midas Kid", Yearling Palomino gelding x The Midas Touch Kid and out of a daughter of Poise N Tuff. Bred and raised by Mark and Deb Iserman, now proudly owned by Laurie Mills and trained/shown by Karla Kegley. See Ya Downtown is a 2009 AQHA/IBHA/ABRA Dun Gelding x Meet Me Downtown & out of a pleasure bred, WP Congress Champion producing Grulla mare. Bred x Eagle Ridge Farm, Proudly raised by Coralie Dewald and owned & shown by Kari & Maria Costa. 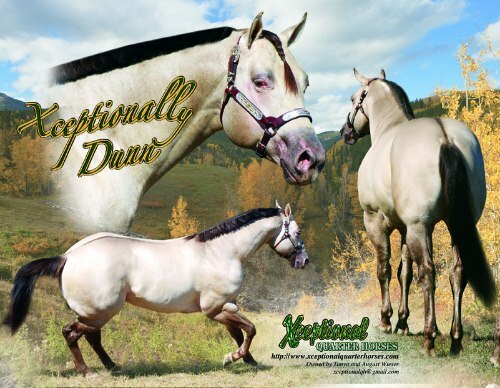 Gold N Centerfold is a 2009 AQHA/PHBA Golden Palomino gelding sired by CLASSIC STYLE GOLD and out of Perpetual Centerfold ( 32.5 AQHA halter pts, Multiple Grand Champion mare) x Perpetualism ( 3X World Champion and Legendary Sire) and out of the Great mare, Sheza Diversified ( 233.5 AQHA Halter pts, Superior Halter Open and Amateur). UPDATE: ~ Qualified for the AQHA world! 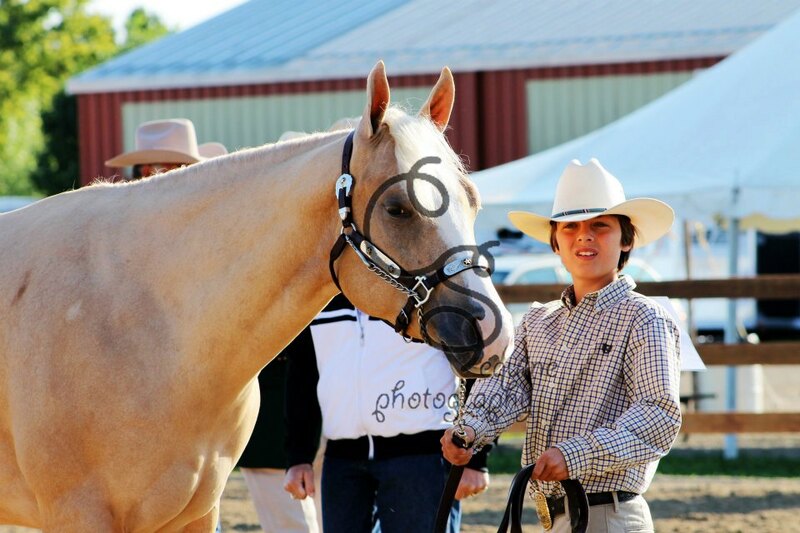 Winning High Point Open Halter Champion @ the QH shows! 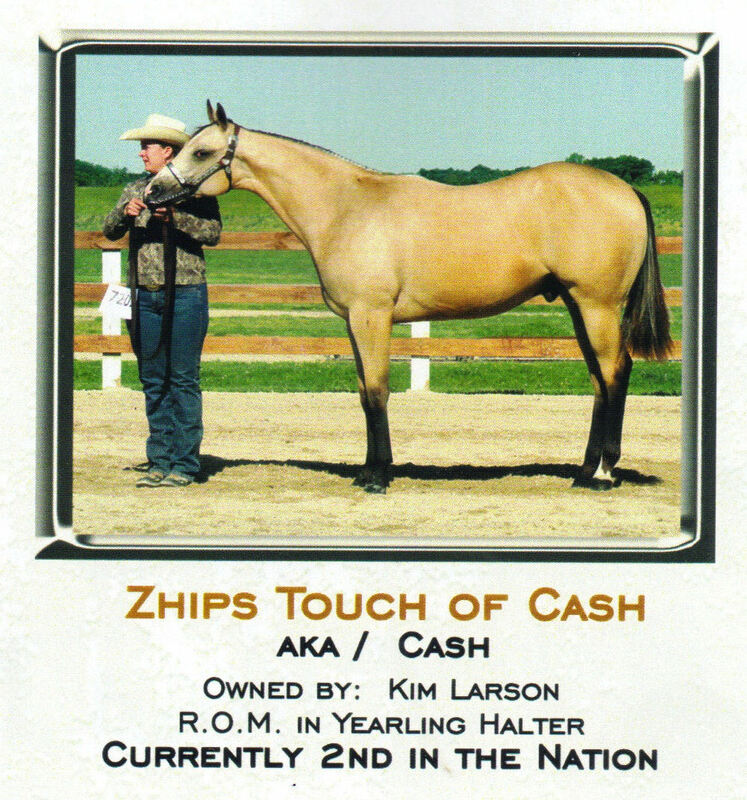 Zhips Touch Of Cash is a 2011 Buckskin Gelding x The Midas Touch Kid and out of a Zips Chocolate Chip mare. Proudly bred, raised and owned by Kim Larson. 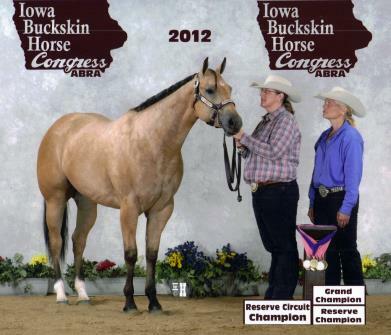 Many Thanks to Cheyanne Craig for fitting and showing him and to Heath Larson for believing in "Midas" as a young stud.